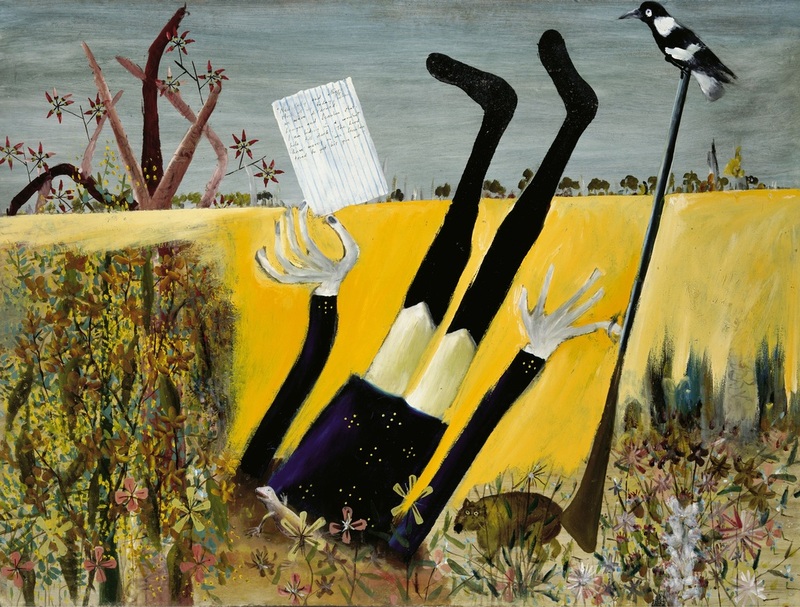 This painting is one of Nolan’s most whimsical works from the Stringybark Creek series. Of the four policemen involved in the Kelly gang’s ambush at Stringybark Creek, Constable Thomas McIntyre was the only one who escaped alive. After fleeing the Kelly gang on Sergeant Kennedy’s horse, McIntyre found refuge in a wombat hole where he hid until dark. The policeman is depicted upside down with his head in the sand, his arms and legs protruding from the hole. The displaced wombat and a scurrying lizard flank the constable, and a magpie perches on the tip of his rifle. In his hand he holds a handwritten note: ‘Ned Kelly and others stuck us up today, when we were disarmed. Lonigan and Scanlon shot. I am hiding in a wombat hole until dusk’.